Next time you need a new keyboard, you might be able to pull it right out of your filing cabinet. 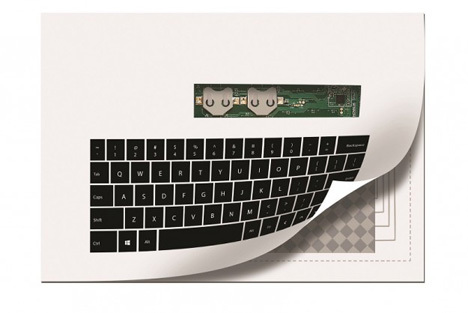 Creative firm Novalia has created a fully functional keyboard that can be printed right onto a regular sheet of photo paper. 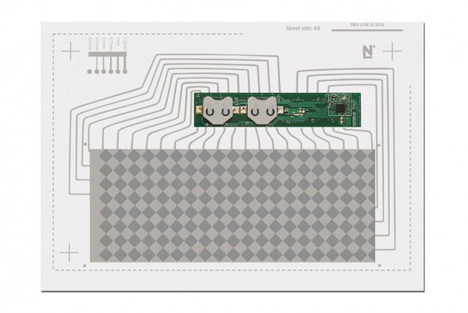 The method they’ve devised would be able to print electronics at the rate of 100 m/minute by using metal plates embossed with the required circuits to carry conductive ink. The conductive ink imbues the paper with the power of capacitive touch. It runs on a small watch battery and connects to your tablet or smartphone via Bluetooth. While you won’t be able to print one out on your office printer, the keyboard can be printed with conventional methods such as screen printing, flexography, and offset lithography. The printing equipment and processes that would make the keyboards are already in use making products like shampoo bottles. A single semiconductor chip is the brains of the keyboard, which can be made using inexpensive materials like cardboard and plastic in addition to paper and conductive ink. 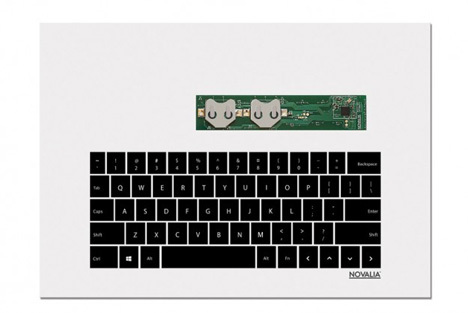 The low cost of the materials leads Novalia to predict that their keyboard will cost an exceptionally reasonable $10. Even more exciting is the fact that the technology could be used to make other super-thin electronics such as touchscreens or trackpads.